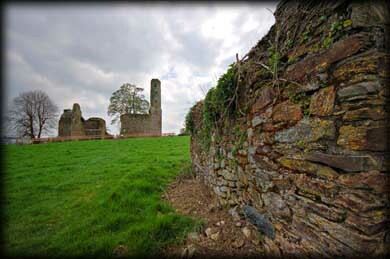 St Mary's Abbey was founded in the 12th century by Diarmuid MacMurrough. An unusual feature of the church is the belfry. It is attached to the nave of the church and is accessed via newel stairs that rises to a doorway above. This lower part of the tower is square, but from here the tower has a two storey circular drum, similar to the free standing round towers, that rises to a height above 18 metres. The upper storey has four square lintelled windows. There are a lot of defensive slit openings in the drum and base. The fact that the tower is attached to the romanesque church may be unusual but it is not unique, there are several other attached round towers. A wonderful example is St Kevin's Church in Glendalough. 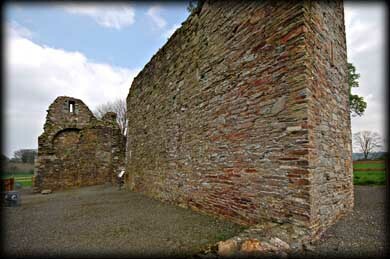 It is also believed that the round tower at St Mullins may have been attached to the church at a later date. The shaped base is another feature that is not unique to Ferns. 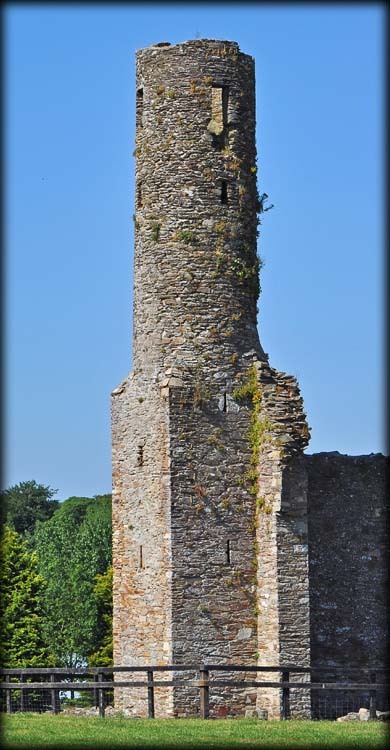 The free standing round tower at Kinneigh in County Cork has a hexagonal base rising to about six metres before changing to the more typical circular drum. Pictured above are some of the many narrow defensive slit openings in the base and drum of the tower. Situated: In Ferns County Wexford. If you drive south to Ferns on the N11 the Church is located on your left as you enter the town. Walk around the back of the church and look to your right. Discovery Map 69: T 0219 4975. Last visit June 2009. Dimensions: Height 18.24 m. Square 3 metre base. Windows: Four lintelled. A number of defensive slit windows in the drum and base. Features: Engaged tower. Newel staircase.